By David & Lana S.
"Very professional & sound company - both in products..."
"Thank you! We were very impressed with the level of..."
Homeowners in Minnetonka, MN were noticing their concrete front steps were beginning to slop and crack. They contacted Innovative to get help with fixing it. PolyLevel injection was discussed and decided on. After the injection the front steps are back to their original position and level once again. The homeowners no longer have to worry about tripping hazards. 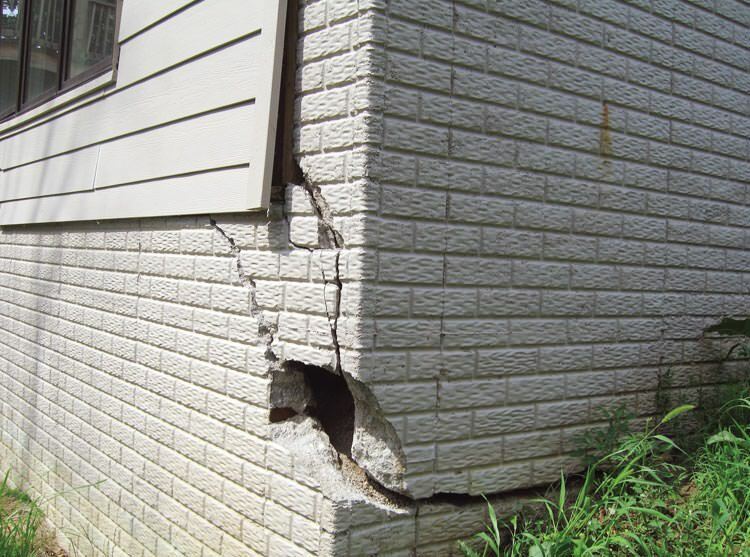 Homeowners from Minnetonka, MN, noticed their home foundation was settling. They had several contractors provide estimates and even had their own engineer they consulted with. After receiving our ad in Valpak, they also reached out to TEAM Innovative for an estimate. System design specialist, Eric Rysdam, met with the homeowners and inspected the home - inside and out. After Eric made his recommendations for smart jacks and helical piers, the homeowners finally felt comfortable and confident moving forward with stabilization. While the job was big one and we had to deal with rain - it was a success and the homeowners no longer need to worry about the integrity of their home. Radon original testing 7.1+ with active sensors (Home sat vacant). Moved in, 2 months later tested with home test 4.1, 4.3 (Bi-level foundation). Need quite and install. Water seeping in basement and wondering what is best approach to solve problem. Foundation cracking at garage. I would like to consult. We have bowed basement walls and would like to explore the possibility of fixing or bracing. We have settling underneath our front door stoop. We also have some cracking and settling in the foundation on the side of our home. I've had some water seeping through my basement wall during heavy rains and wanted to get suggestions for dealing with it. Looking for a quote to lift a concrete slab. Thanks! I never had water before and I never want it again, Innovative was the only choice for me. At Innovative Basement Systems, we not only adhere to the highest industry standards, we strive to be the industry leader in the home improvement related services we provide. We also use state-of-the-art products and technology which are designed to fix your home. We are the trusted Foundation Supportworks dealer in Minnetonka, MN. If you have problems in your foundations, it is most likely caused by sifting or weakened soil that can no longer support the weight of the structure. The major signs you need professional help with your foundations are cracks in the floors and walls, tilting chimneys, or sagging floors over a crawl space. Foundation piers and jack posts can easily remedy sloped, uneven floors by using soil that is stronger and able to support weight. For bowing or leaning walls, wall anchors and I-Beam wall braces will permanently correct any problems. Call us today for a free estimate! For floors, sidewalks, and patios that suffer from uneven concrete, we utilize the PolyLevel Concrete Leveling System. The PolyLevel gets injects under the concrete slab, raising it so that it's even with the concrete around it, eliminating the need to replace the entire concrete slab. Whether you're thinking of refinishing your basement or just want it to have a neat clean look, our waterproof walls and floors and a no-brainer. Our EverLast wall panels are 197% stronger than regular drywall and look beautiful without any painting at all! Get the smart choice for your basement and the expertise from a Innovative Basement Systems specialist to make your basement a more comfortable living space. As an area of the home that can be easily neglected, crawl spaces can become a breeding ground for mold, mildew, wood rot, and even small pests and rodents. Don't let your home fall victim to a crawl space problem and get your crawl space inspected by the professionals at Innovative Basement Systems. We use excellent quality products like vapor barriers, thermal insulation, and dehumidifiers to keep your crawl space clean, dry, and healthy. No crawl space encapsulation system would be complete without a sump pump and stellar drainage systems to take any water that enters your crawl space or basement and deposit it a safe distance from your house. The TripleSafe sump pump utilizes expert engineering with a primary pump, a secondary pump, and a third battery operated backup pump. Give yourself the peace of mind you deserve and get your home inspected today! Innovative Basement Systems has the tools and the expertise to get your foundation, basement or crawl space repair project done right the first time. Our team of friendly staff and trusted technicians are ready to work with you to find a solution that will work best for you! Call us today for a free estimate! The large void under this slab was created by erosion and will weaken slab over time. PolyLEVEL will be used to fill the void and stabilize it from being damaged. Homeowners, Mike & Irene, from Minnetonka, MN, noticed their home foundation was settling. They had several contractors provide estimates and even had their own engineer they consulted with. After receiving our advertisment in Valpak, they reached out to TEAM Innovative for an estimate. System design specialist, Eric Rysdam, met with the Mike & Irene and inspected the home - inside and out. Eric made recommendations for stabilization with smart jacks and helical piers, and the homeowners finally felt comfortable and confident moving forward with stabilization. While the job was big one and we had to deal with rain and mud - it was a success and the homeowners no longer need to worry about the integrity of their home. Another foundation stabilized in Minnetonka, MN! After receiving the home as a gift from his parents, homeowner from Minnetonka, MN, wanted to attempt to get a grant from the city for home improvements, including an energy audit. He also mentioned his wife had allergies. Before meeting with the experts at Innovative Basement Systems, he never considered the problems could be coming from his dirt crawlspace. After meeting with system design specialist, Eric Rysdam, crawlspace encapsulation with drainage matting and CleanSpace vapor barrier was recommended and installed. Another happy homeowner in Minnetonka, MN! After seeing our coupon in the Dollars & Sense Magazine, homeowners from Minnetonka, MN, contacted Innovative Basement Systems as they were concerned with their bowing and cracking basement walls/floor. We sent out two system design specialists to this estimate to ensure we offered the right solution. After thorough inspection, recommendations were made for PolyLevel as well as Carbon Armor and PowerBrace for foundation wall repair. While full lift wasn't achieved as the garage wall was moving with it - the homeowner was happy with the job and is relieved her foundation walls are now secure and warrantied for life! Duane and Debbie first called Innovative Basement Systems when they noticed mold growing on their laundry room walls. Although they didn't have any water, the humidity gave the house an overall feeling of "dampness". System Design System Neal Schumacher put together a plan to stop the mold from forming, along with getting rid of the damp feeling throughout the home. Primary Foreman, Dan Widenstrom and team came out to the house and got to work. The team first installed a Triple Safe pump system with twin liner along with UltraSump battery back-up pumping system, and a WaterWatch alarm system. To keep the humidity low and to circulate clean air throughout the home a SaniDry Upright was installed. To help keep the walls clean and dry BrightWall paneling was installed. Since Duane and Debbie had work done they no longer experience mold or humidity problems in their home and basement. After dealing with a flooded office basement for quite some time a office owner in Minnetonka, MN called a local contractor to fix the problem. Not only did the work done from the local contractor fail, it made the flooding in the basement worse. That’s when Innovative Basement System stepped in and put the office owner's mind at ease with our WaterGuard and SuperSump sump pump system. With their new system in place, the office basement no longer takes in water and is now being used as valuable storage place. Third time with water in the basement, not related to plumbing, connected to rain and gutter/drain pipe location. Wondering if we have a foundation issue. Plan is to remodel the basement and bring up to code. Old panelling and previous water problems are prompting a long term solution. Water damage inside basement walls, wood rot and mold. I have a PWF home (split-level walkout basement, built in 1987) in which one basement bedroom had some black mold building up on the drywall in the corner of the room (on what is the exterior corner of the house) I have removed the affected drywall and in the process, exposed some very wet insulation (also removed) The studs and wood sheeting don't seem to be too compromised from the interior. The wood is still firm, however it is visibly saturated at that bottom corner of the room. I would like to find out if there is any solution short of excavating down to the slab and re-waterproofing from the exterior. Would like a quote for installing a vapor barrier in my crawlspace.